My favorite part of the conference was definitely getting to meet so many amazing bloggers (many of whose blogs are my daily reads). These girls are even more amazing than I expected them to be. 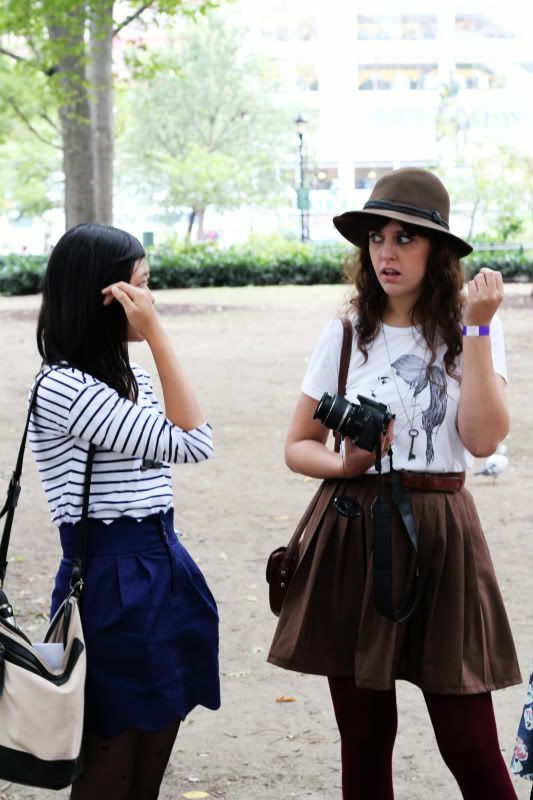 Being fashion bloggers, we of course camera whored ourselves and each other around NYC. My favorite shots are always the candids, especially the one above of me and Starr. I have no idea what we were talking about but I'm sure it was amusing, haha. I'm also loving the candid of Lucy from Dear Fish Vintage down below. Can I just say she's got amazing style? The picture above of Jasmine and Chantal is one of my favorite shots I took that day. They're both so adorable and they're also down to earth, which goes for all the other bloggers I got to meet this past weekend. It rained a little bit on Sunday (notice the umbrellas - especially Jenny's badass parasol) and the wind was a little bit crazy at times. It made for some awesome photos though. There's nothing wrong with a little bit of drizzle...well, until it gets on your camera. I used to drag around my old camera in the rain, onto the beach, you name it. It wasn't so bad at first, but in the long-run it damaged the innards of the camera body so I'm learning to be a lot more careful with my equipment. 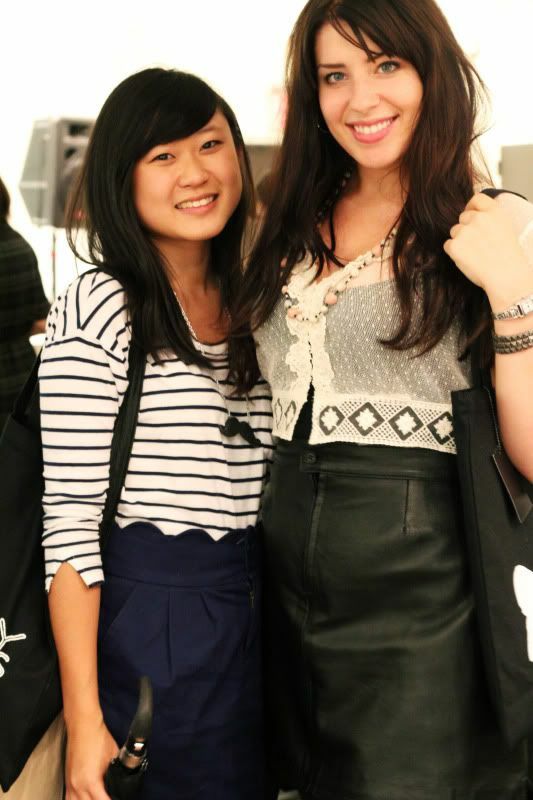 I also got to meet Emily from Adelaide Stayed at the Chictopia conference and let me tell you, she's gorgeous in pictures and a million times more gorgeous in person! She also got lucky and won the iPad giveaway courtesy of The Find. Jealous? YES. 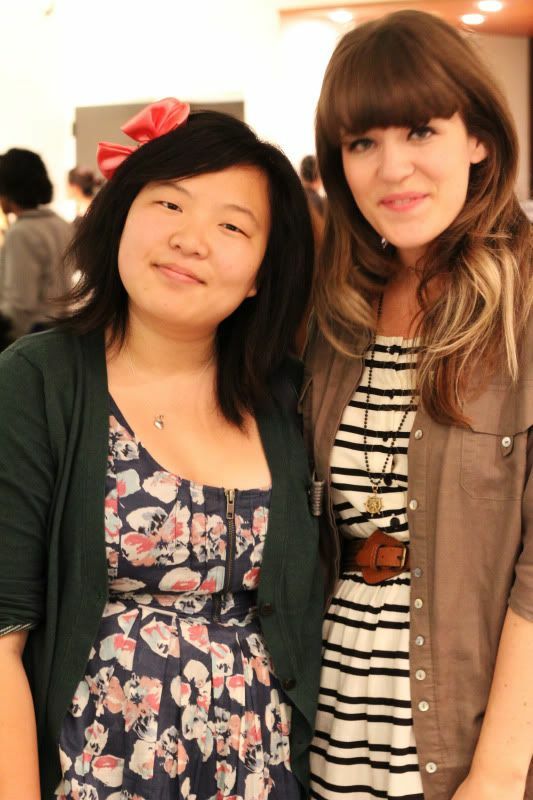 Another one of the many bloggers I met was Tieka from Selective Potential. She's a sweetheart and I snapped a shot of her and Jasmine. The lighting wasn't the best and I kept on forgetting to set my white balance but I'm getting better at remembering! Check back for my next post on the Juicy Couture After Party! your outfit is perfect! really loving that skirt. I'm so jealous I live on the other side of the world. Yay for Blogger Meets. This looks like so much fun! your little necklace makes me so happy! Same with the pattern mixing. this is something I would wear in an instantt!! Such great pictures. 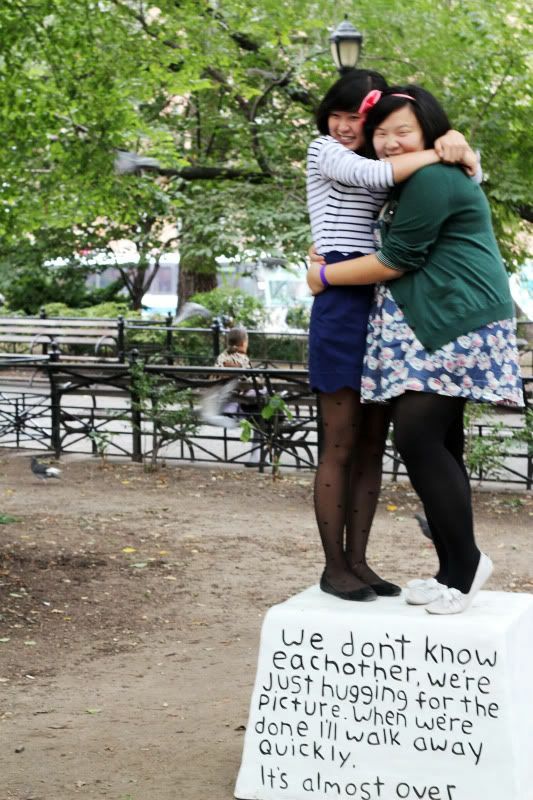 I love the text on the rock that you and Jasmine are standing on. So cute!! Your skirt and mustache necklace are adorable dear. Looking gorgeous as always. Awww it looks like you guys had a ton of fun!! Lovely pics!! i'm so happy at how great this skirt looks on you (and jealous that we couldn't make a dynamic duo out of it though)! this day was so so so so fun and i really wish we were back there :( <3 miss you lots! 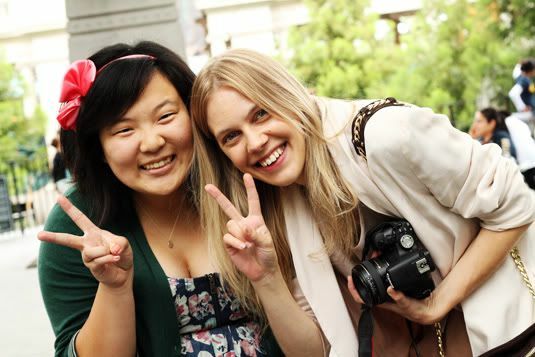 Love all these pictures from the event! Glad you had fun too! Your outfit is adorable, I love that skirt! amazing post.. i was just in jasmine's blog telling her that my fave shots were you and her in that quote block and your shot of jasmine and chantal!! so so cute!! oh, i love your skirt, btw! Love you skirt, scalloping is my fav atm. Sounds like you had a great time! It looked like so much fun. Plus,your skirt is so adorable ! sounds like a great day! lovely pictures too! you look gorgeous here, I really love your outfit! Looks like you all had a lot of fun! Wish I could have been there..
Can't hardly believe that I found a fashion blogger from New Jersey (Central Jersey, specifically!). 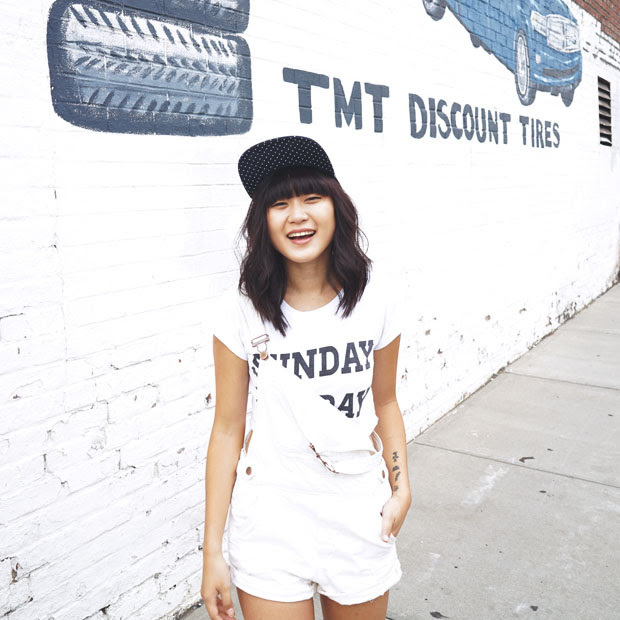 I adore your style and your outfits! 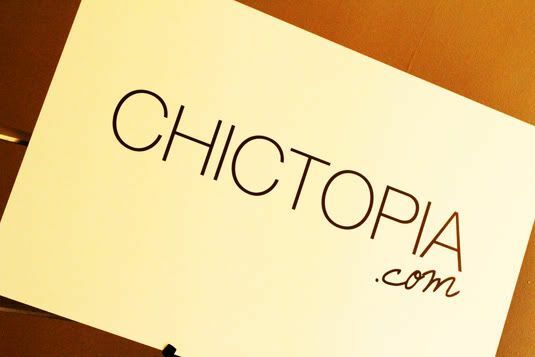 I love your skirt, I hope to go to the chictopia10 conference one day, and you guys look like you had a blast!! I want your blue skirt! All these lovely ladies! 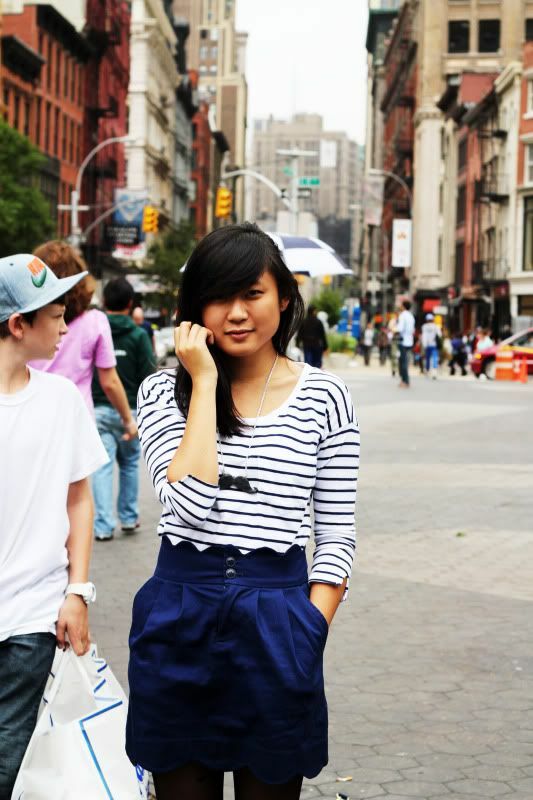 I'm loving your fall nautical look... well, it works year-round, really. 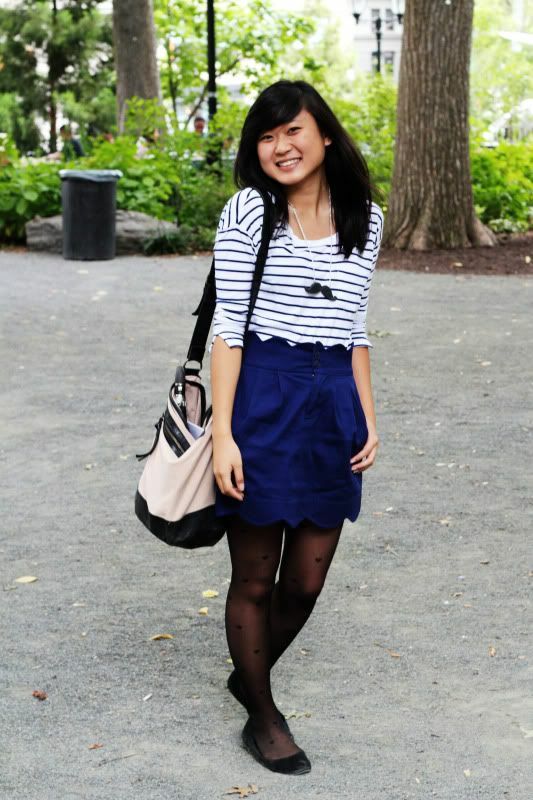 :) But I just love how the blue skirt pops with your black dotted tights!